While many painters eagerly await the snow to melt and the weather to warm up, we also dread the idea of painting in the hot sun and watching our beautiful face paint drip off the faces of our customers. The nature and hopes of skin safe face paint is that it easily removes with soap and water and we typically don’t want it to “last” longer than the length of a party. But the exception to that desire is summer. Damp, oily, sunscreen covered skin is one of the hardest canvases to paint on. Most face painting related reactions are caused by mixing face paint and sunscreen on the skin. When a child sits on our chairs and their skin is already sweaty, we have to use the extra time to wipe them down before starting or the paint wont even last a brush stroke. 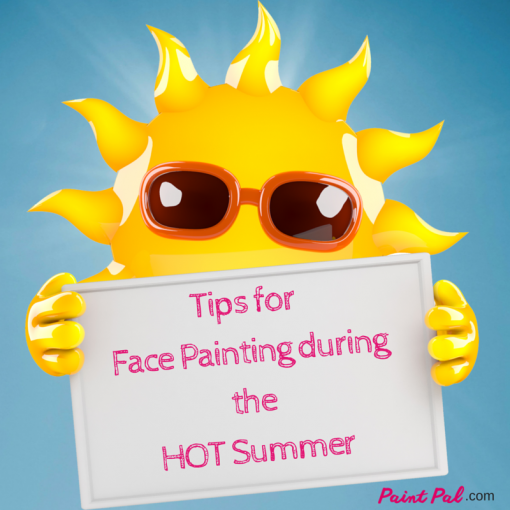 So what do face painters do during the summer months? Luckily for us the make up industry has evolved and grown to help us maximize summer with lots of variety of paints and mediums. 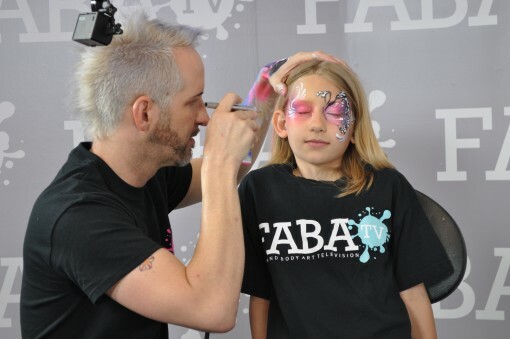 Most painters are used using water based face paint (FAB, TAG, Wolfe, DFX, etc etc) and we apply them with water and they remove easily with soap and water. They are usually in cake form (meaning they need to be water activated) the waterproof alternative has always been grease make up , where you have to “set” it with baby powder to make it sweat proof. Its is the farthest from ideal for face painting and can be a mess. 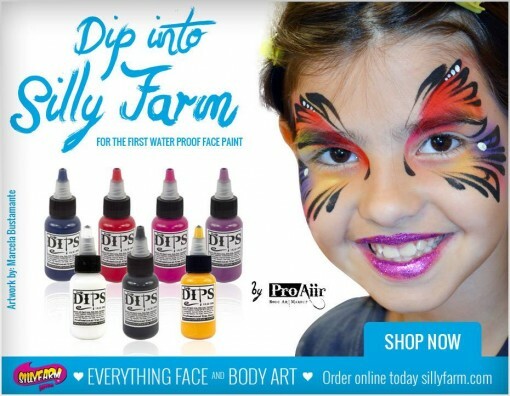 About 4 years ago Donna Nowak of Show Offs Body Art developed a product called Dips that is a waterproof face paint perfect to offer during the hottest summer events or during water side parties. Dips are slightly different than our common cake make up brands. They are already in a liquid form and do not need to be activated with water. Because they have a slight amount of alcohol in them they tend to dry faster on the skin and don’t blend as easily as a rainbow cake does. Dips are a great alternative to grease make up and cake make up and can be used with your cake make up to extend the life. For example. You can apply the base coat with a rainbow cake and then outline the butterfly with Dips for a long lasting outline and design. Be advised when using Dips, because they include alcohol its recommended not to use directly on the mucus membranes (near the eye sockets) because of sensitivities. Also, alcohol is known to evaporate under heat, so you will need to keep a little bottle of alcohol with you to thin out Dips should they get thick or if you need to thin them out. Starblend Powders have been a heavily used product for theater make up for over 50 years. Because of their chalky and matte consistency they have been favored because they don’t shine or appear glossy while on stage under bright lights. They have also been used to “set” grease make up because they have a powdery feel to them. 12 years ago Marcela “Mama Clown” started using them along with Ben Nye Lumiere Powders as base color for face painting designs. The benefit to using Starblends and other powders as a base coat especially during hot summer months, is that you can apply base color super fast, and since it goes on dry it helps dry the skin out. When we apply cake make up as a back ground, it is typically damp. So it adds more moisture to the skin. Making our canvases a little soggy before we complete our designs. The Starblends and powders are typically applied with a smoothie blender dry. They go on smooth and don’t need to be “set”. And because they are applied dry they help you start off with a dry base and then you can apply your line work on top without having to wait for drying time. Starblends come in a variety of colors and I usually recommend red as a must have in your kit to help you achieve fast spider mans that are comfortable on the skin. The difference between Starblend powders and Ben Nye lumiere powders are that the Ben Nye line has a shimmer and the Starblends are matte. 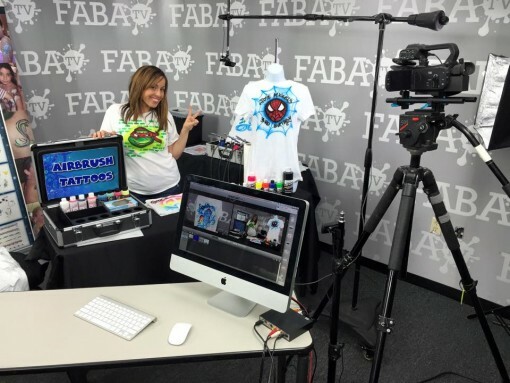 I also taught a class on FABAtv about Airbrushing and how to maximize profits so make sure to check it out. The upside to airbrushing on the skin is that there is make up that is waterproof (inks) and they are awesome for summer and for water events. 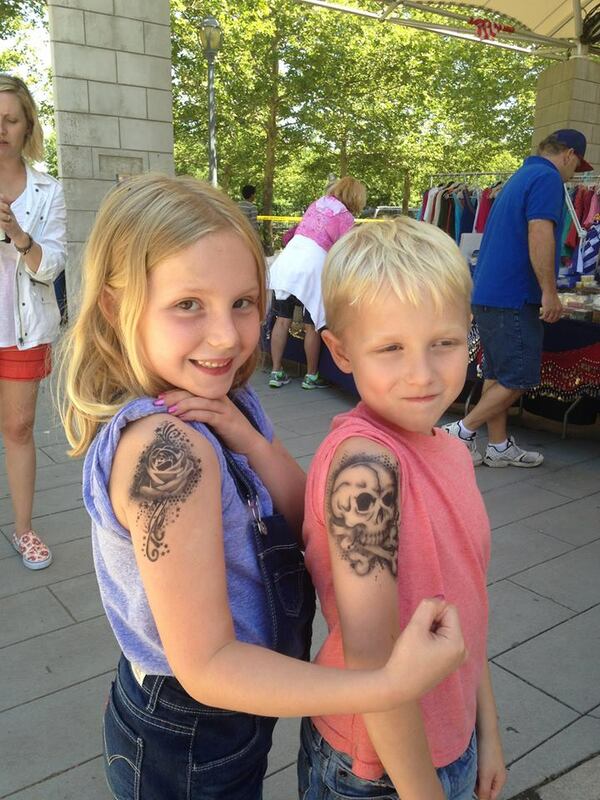 Airbrush tattoos are really popular and a great sell because they are fast and last long. The down side to airbrushing is that its an investment in equipment and also time. I always recommend learning about airbrushing before taking the plunge to buy a good system. A practical system where you can airbrush with multiple colors ranges from $900 to $2000. So you want to learn about airbrushing and what it entails before you invest that kind of money. You also want to learn how to clean your system to avoid clogs and broken equipment. 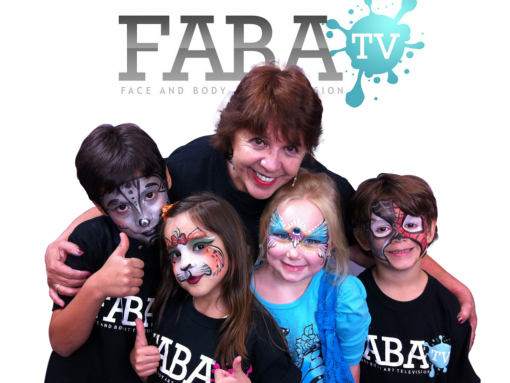 Great news is you can learn everything you need to know about airbrushing on FABAtv. There are 2 common types of make up used when airbrushing on the skin. There are Inks that are waterproof and have ethanol alcohol in them so once they are dry on the skin they are meant to be waterproof and remove from the skin with baby oil or alcohol. And then there are hybrids. Hybrids contain a very small amount of alcohol and help with longevity but still remove with soap and water. It is not recommended to use inks on the face for airbrush face painting. Because when alcohol gets near the eyes it can be irritating. Inks are mainly used for airbrush tattoos which are popular with all age levels and a HIT during summer. So dont be afraid to trade in your brushes for airbrushes to maximize summer. Hybrids are good to use for the face if you want to offer longer lasting face painting. I rarely airbrush on the face ( besides make up) because I find kids aren’t the biggest fans of air blowing in their face. So I stick to tattoos and they work out great. Water based face paint was designed to remove easily and not withstand excessive amounts of sweating. There are some great sealers and fixative sprays that help the longevity of the face paint but ultimately they cant make them waterproof. 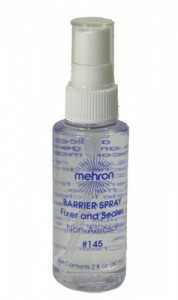 In my personal experience with fixer sprays I prefer to dry the skin off first and then spray the skin with fixer spray. this way it seals the pores and acts as a barrier. Then I paint on top of the skin. If I really want a longer lasting stay I lightly mist the skin once I finished the design. I don’t recommend using fixer spray on every child because its time consuming and also because the fixer contains a little silicone and alcohol it can be tingly on the skin for kids causing them to feel itchy. So, I use it sparingly and mainly for adult faces. You are probably better off using powders or dips if you really require a long last.